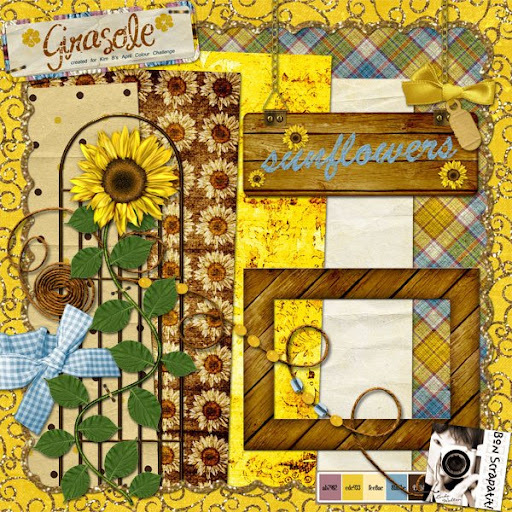 Bon Scrapatit Designs: *GIRASOLE*, PART ONE HAS ARRIVED!!! Bet y'all thought I wouldn't make it back tonight, eh? ROFL! Well, I think I said I'd be back before MY night was over, which gave me the EXTRA time I needed to get it together! TADA - I made it!!! YAHOOOOO! I hope you've all had an EXCEPTIONAL day and if you've not been out and about in SCRAPLAND stocking up from some of the INCREDIBLE sales going on, MANY sites are running their sales through today as well! WOO HOO! My personal thanks to ALL! I took a break and went out and did some CU shopping! I shouldn't have, but could not resist some of my FAVORITE designers at 35-40% off!!! WOO HOO! Just MORE product with which to create MORE goodies for y'all! LOL! Without further ado, here is *Girasole*, Part One! I hope y'all can find some good uses for it! Aside from scrapping, it will be WONDERFUL for homemade digital/hybrid greeting cards and other craft projects!!! See you back tomorrow with *Girasole*, Part Two!